Who is a modern shaman that works in the middle of the big city? 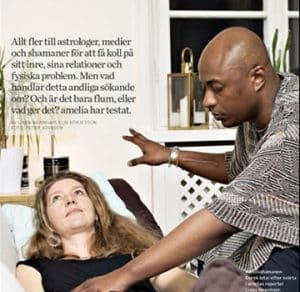 Shaman Durek is said to be one of the world’s most powerful shamans and has worked with rock stars, Hollywood celebrities, successful Wallstreet brokers, topmodels, European royalties and the Prime Minister of Iceland- of course Amelia wants to meet with him when he is in town. I really didn’t know what to expect when meeting with a shaman but I quickly realized that my prejudices were killed. Instead I meet with this American guy dressed in gray slacks and a t-shirt. He looks more like a hipster than a healer. And when I attempt to shake his hand he moves forward and gives me a hug. A soft and warm hug filled with joy as if we were best of friends. – Shaking hands feels like keeping a distance, he says with a smile. He is full of these smiles. It’s very disarming. The apartment we meet in is not decorated with typical “spiritual symbols” like incenses, tinkling bells, angels or dreamcatchers. It’s like if he’s in no need of any type of manufactured mystery. He tells me that he has known that he was a shaman since he was five and that his mother helped and guided him to wisdom. – She knew I could feel and see things others couldn’t and she was quite unbothered about it. At 11, he began his training to become a shaman in San Francisco. And as a young man, he traveled around the world to learn from gurus, healers and sages from all sorts of religions and cultures, always with certain skepticism. Now he combines all his experiences and knowledge and gives the right help depending on the person he meets with and his/her different needs. The reason for visiting Sweden on a regular basis is because of friends and also his strong feeling that the country is in need of a little bit of help. – Swedes are so beautiful, not only on the outside but in their souls. There is so much potential here, but when I’m walking around town and listen to people’s thoughts I find frustration, anger and an unwillingness to let go of things. People are judging each other and they’re not truly themselves in fear of being judged. They’re comparing and measuring themselves against each other as if they were competing. It’s important to know that everyone of us has something unique to contribute to this world, something no one else can copy. There is no one like you my dear, which means it’s your turn to shine! But if you limit yourself, you’re holding on to a beautiful gift that you could have shared with the rest of us. – Why are you here? Not to live someone else’s life or dream. You are here to live your dream. He looks me straight in the eyes, as if to emphasize the importance of this and then suddenly – he calls for the spirits. “Let’s see what the spirits have to say about you.” He listens carefully and speaks to me rapidly – in order to have time to tell me everything they have to say to me, a bit like an interpreter. – They say that you’re a good person, but that you’re not happy with just being that. That’s the reason why you put yourself out there to help others and make them feel good, but you forget to take care of yourself. – They say that you have many beautiful and creative ideas that they want to help you realize, but you are causing so much confusion and distractions in your endeavors that your ideas end up on the back burner. Shaman Durek says that in shamanism women are the real leaders, the divine donors and the ones who will move the world forward – this is why me (and my sisters) must stop doing this. – While men are more “look at me, look what I’ve done,” women tend to ask “What can I do for you?”. Women care about others and have an incredible intuition. – That’s why I only have female employees and I mainly listen to women’s advice. One problem is that many women constantly give and give and they tend to empty themselves. That’s when the feeling of frustration and the feeling of not being loved and appreciated set in. You have to fuel your own energy and strength as well. – Another mistake you women do is that you’re searching for love outside yourselves. You have to let go of the idea of who you’re supposed to be or become. Have you ever noticed that humans are the only species that is trying to adjust in order to be loved? Stop with that. You are good enough and perfect as you are. Embrace it. – You’ve seen many people get hurt and you want to protect yourself from being exposed to the same things. He gives me tips on how I can let go of my fears and what I can gain by doing so. Then he talks about my relationship with my parents – and every word he says is true. How the heck does he know? (the spirits of course, what else.) Then he explains why I’ve chosen them, what kind of wisdom they’re here to give me but also which issues we have between us. In one case, it’s all because of a conflict in a previous life. Then he asks me why I stayed so long in a malfunctional relationship. I provide him several answers where one is about how I wanted to show my ex other and happier ways to live. Shaman Durek tells me that it was all well intended of me, but that it was really about something completely else – according to the spirits. – Maybe I was afraid to fail, I finally say. – For a second there I was worried that maybe you didn’t know. He keeps asking me things, like what I want to do with my life. And the more he asks the easier it is to respond. When seeing my psychologist I often find myself feeling awkward when realizing and learning things about myself, whilst here I feel relieved. After a number of insights it’s time for physical treatment. I get to lie down, he presses my stomach and looks for certain areas where the “darkness” sits. He then pulls it out of me and does an exercise where he’s fueling me with new energy. He puts the music louder and says things that I must repeat like a chant or mantra. “I have so much strength in me that I can increase the energy in my body and make use of it. And with this strength I can cleanse my body from stress. I love the strength that I possess, but I had to go through many trials to gather it. I take responsibility for the pain I have exposed myself to down the road. And you, little girl inside me, you who form my soul, I take responsibility for having failed you. I want you to know that I’m here now and together we are strong. Little girl, I will listen to you from now on and hear what you have to say. I will not judge myself anymore. I have the power. I am ready to stand up in my full glory. When I finally get to sit up again, I feel fulfilled and I walk away with a feeling of having gone through my life’s detox – an hour of physical and spiritual purification. There and then, I would recommend all my friends to also experience this. With one warning – you can become enlightened on top of it. Beware!